Deliver a report quickly to Carnius in Fort Frostmoth. Speak to Falco about your next assignment and be given a report to deliver to Carnius Magius in 5 hours. Travel to Fort Frostmoth to find Carnius but discover he is gone. Speak to Constans to learn where Carnius has gone to. Give the report to Carnius. Return to Falco for your reward. Speak to Falco about your next assignment, the delivery of a Colony Status Report to Carnius Magius within 5 hours (see important note below about the time allowed). Remember that this is five hours of game time, not real time (a fast character should be able to make it there in under 30 minutes). If the time expires, you'll receive a journal entry to that effect. You may find that with the short time requirement on the quest, you don't really have time to stop for exploring or fighting. It's best to use Speed-enhancing items and/or spells. Avoid using the ship between Raven Rock and Frostmoth; ship travel time is randomized, and may take much longer than you want in game time. After a quick run (or a quicker Divine Intervention) to Fort Frostmoth and up to Carnius' chambers, you find that he isn't there. Instead, you'll encounter his new assistant, Constans Atrius, who will say that Carnius has just stepped out, possibly to inspect future expansion sites. Carnius will be found in one of three random locations (determined when the quest is activated), as detailed below. Once you speak to Constans, a trap will be activated, most likely set on purpose by Constans or Carnius to slow you down. The trap casts a spell called Trespasser's Bane that inflicts Drain Agility by 50–100 points for 600 seconds, Drain Speed by 20–80 points for 600 seconds, and Burden by 100–200 points for 300 seconds. The trap is set in the rug in the room, so Levitate or Jump over it, use Resist Magicka spells or equipment, or step carefully around it. If you do trip it, you can go right downstairs and use the Imperial Cult Shrine to restore your attributes (though you may still be Burdened). He is particularly easy to find at night due to the torches he and his guards are carrying. It will take at least 45 game minutes to reach him from the fort, at normal running speed. Felsaad Coast: You may or may not have already run across the arch and tomb, Valbrandr Barrow. If not, it is plainly visible on the paper map of the island, northeast from the fort. It is directly north from the Sun Stone, if you've done the Main Quest. Once you find the arch, head southeast towards the coast. Carnius will be wandering right along the coastline (location -151730, 165039). Supply Ship wreck: It is on the southwestern coast of the Hirstaang Forest, where you found it previously, northwest of Raven Rock. Brodir Grove: It is northeast of Raven Rock; just run directly from Fort Frostmoth. Give the report to Carnius (use the dialogue topic report), who will be rather "surprised" that it arrived on time and that you were able to find him at all. 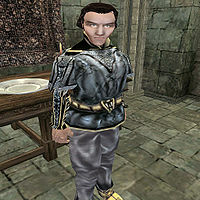 If you successfully deliver the report to Carnius in time, return to Falco for a 1000 gold reward and a 12 point boost to your faction reputation. If you fail the quest for any reason, you will be expelled from the East Empire Company faction when you return to Falco; you cannot get back in. You should refrain from using Veresa Alver's ship as a means of transport, as the trip can take much longer that way and may mean you won't be able to deliver the report on time. There are some weird things going on with the time period allowed for the quest. Although you are told you must deliver the report within 5 game hours, it seems a bug in the ColonyReportTimer script would let you have infinite time if you happened to start the quest during the hours of 6 to 9 (or so). Perhaps the developers were aware of this bug, so they also limited it in real time to 600 seconds (10 minutes). Thus, you must satisfy both deadlines: 5 game hours and 10 real minutes. If you happen to find Carnius before you talk to Constans, Carnius will be exploring but you cannot talk to him about the topic report. 10 Falco has told me I must deliver a report to Carnius at the fort within the next five hours. 20 I have arrived at the fort, but Carnius is not here. I've been told he can be found at Brodir Grove, so I'll have to take the report there to get it to him on time. 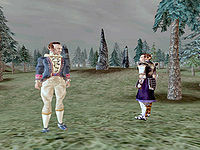 30 I have arrived at the fort, but Carnius is not here. I've been told he can be found at the shipwreck site on the West Coast of the island. I'll need to hurry to get the report to him in time. 40 I have arrived at the fort, but Carnius is not here. I've been told he can be found along the coast, east of a large rock formation and burial tomb. I'll need to hurry if I'm to give him this report in time. 50 I have delivered the report to Carnius on time, and should let Falco know. 60 Finishes quest Falco thanked me for being able to deliver the report on time. 100 The five hours has expired; I have failed to deliver the report. I should let Falco know the bad news. 110 Fails quest Falco fired me for not delivering the report on time. This page was last modified on 10 September 2017, at 02:42.